If you read my post about how the creative process works for me it will not be news that I tend to (over) analyze my pieces even after I deem them done. This is exactly what happened to my blue birdhouse. I kept looking at it as it hung on our door and felt that something was wrong. After a couple of days I realized what it was: it was lifeless. 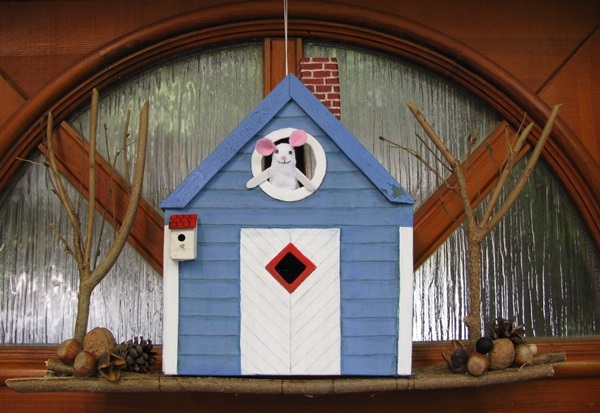 I know I said I wanted a birdhouse that was empty and waiting for the nesting birds to return in the spring. But I realized this is not us! If I looked at all out other door ornaments, it was always full of life and fun. The winter wreath has snowmen while our summer wreath gardeners. I knew I had to have someone or something in the house to make it right. A while ago I searched around for ideas, inspiration and tumbled into Larissa Holland’s world on mmmcrafts. Oh my! I simply fell in love with her style! It reminds me of folk design, but with a modern twist. 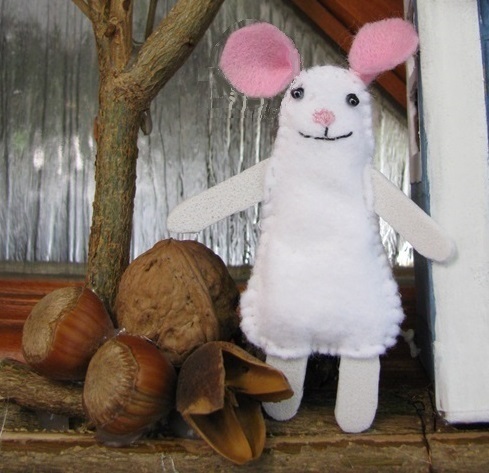 I believe I pinned every single felt creature, ornament, design she made on my Pinterest board. 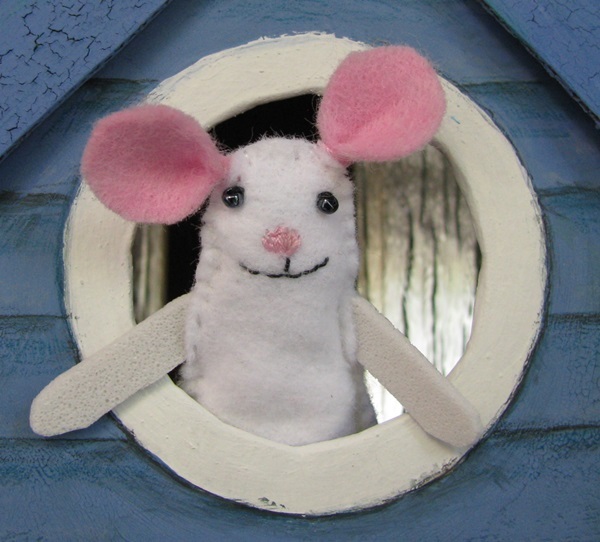 There was one little creature in particular who heightened my curiosity this time: Tucker the little mouse. Why a mouse? As I was flipping through my sketchbook I saw an old drawing I made a couple of years ago. 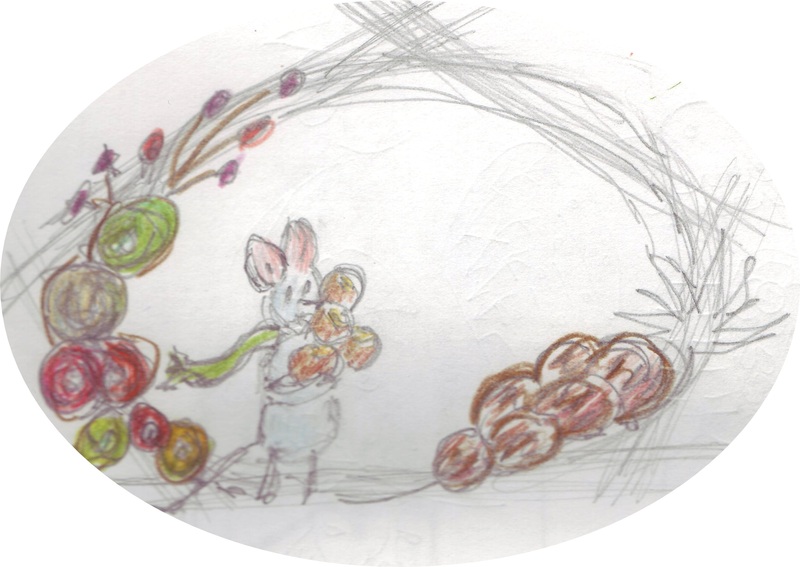 It was an idea for a fall wreath that had a little mouse collecting summer’s bounty for the scarce days. I am not sure if I believe in fate or not, but this sure felt like it. Before I knew it my little mouse was born. The rest of the design (I know it sounds strange, but) just happened. For the trees I collected some branches in the garden. I started to glue together little pieces at random with hot glue gun. Once I liked the outcome, I pruned it to shape. The trees are attached to the base with glue gun as well. This is hidden with walnuts, hazelnuts and chestnuts. The very bounty the little mouse would collect. Now that the house had a little tenant it lit up. It was full of energy and life. Every time I leave or come home a little smile is there to welcome me. This is what I was originally missing, and this is what I have come to find. Looking at it I knew this is it! NOW it was finished. OK… one last thing. If there is a creature, it must have a name, right? As the Rugby World Cup (one of my favorite sports by be way.) is in its full swing right now, I thought it is right to honor this great event. This is how our little smiley friend came to be known as Scrummage.